Creatine on its own can do a lot for your workout. Backed by scientific study after study, creatine is proven to deliver explosive gains in muscle size, strength and power. But Creatine Boost® from Bio-Synergy improves on the formula to help you unleash even more gains. Don’t be fooled by the juicy taste – this is a power supplement. Every serving provides an impressive 6.4g of creatine monohydrate – that’s more than most other products in the category – as well as an exact dose of pure dextrose. Studies show that dextrose accelerates creatine absorption and uptake in your muscles, giving you better, faster results than creatine alone. Also, Creatine Boost® contains over 1g of L-glutamine per serving to support muscle recovery and repair. Research suggests L-glutamine is essential for anyone who takes their training seriously. And you get all of this in a deliciously refreshing drink. At Bio-Synergy, we want to help you achieve your goals as soon as possible. Whether you’re maxing out reps in the gym or pushing yourself to extremes in your sport, creatine is arguably your best ally to boost strength, stamina and performance. Since the early 90s, creatine has been the go-to supplement for the athletic community, and for good reason. Ask any personal trainer to name the best legal supplement for increasing size and strength, and their answer will be creatine. 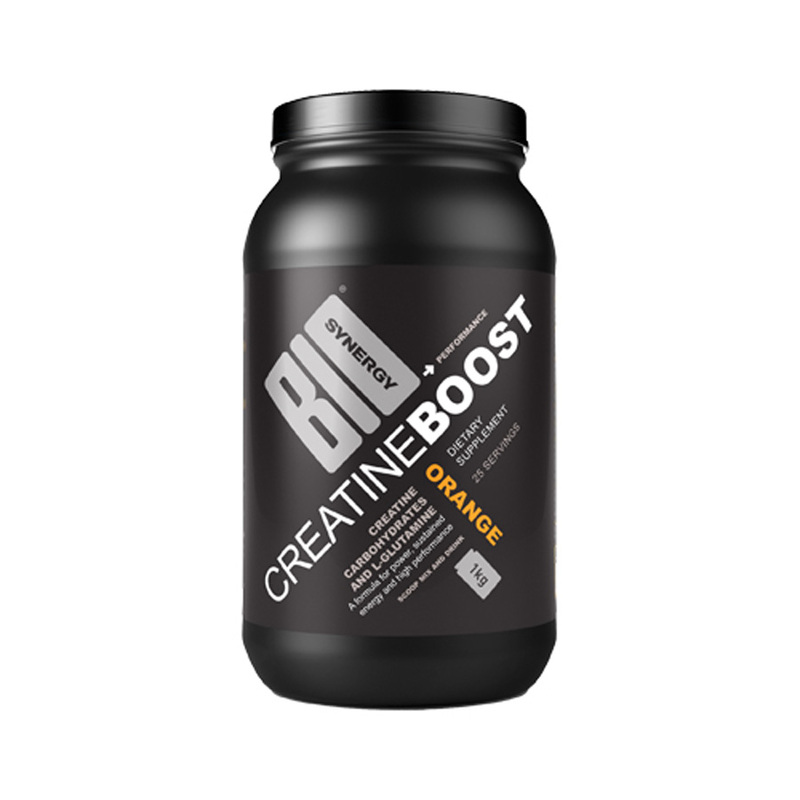 Taking creatine on its own has highly positive effects on athletic performance, but at Bio-Synergy, we’ve taken it a step or two further with Creatine Boost®. Included in our formula is L-glutamine, an amino acid that’s one of the building blocks of new protein, which helps accelerate muscular development after any kind of workout. We’ve also included ‘creatine boosting’ dextrose, in the exact amount to improve the absorption of creatine into the muscles. So, whether you’re lifting weights, powering through cardio, or pushing to progress in your favourite class, our refreshing orange flavoured juice is an ideal method for sending creatine and L-glutamine into your stressed muscles. Bio-Synergy Creatine Boost® was one of the world’s first creatine monohydrate supplements to come in a drink. IS CREATINE BOOST® RIGHT FOR YOU? If you’re looking to boost your strength, stamina and performance in your sport, then yes, it is. We’ve developed it to be one of the most effective creatine supplements you can find. For almost 20 years, Creatine Boost® has been the go-to product for weight lifters, gym goers and athletes, who have surprised themselves with their newfound capabilities and keep coming back to us for more. We’ve got you covered with a wide range of other performance products: Creatine Plus®, Activeman Energy Charge®, Essential Sports Fuel®, Activeman Thermolean®, Whey Better® and Vegan Lean&Green®. As with all our products, Bio-Synergy Creatine Boost® is made from the highest quality creatine monohydrate, L-glutamine and glucose. What’s more, Creatine Boost® is manufactured in our own UK-based facilities by an expert team of scientists. That’s how we ensure all our products are made to the same high standards. Dextrose, Creatine Monohydrate, L-Glutamine, Natural Orange Flavouring, Citric Acid, Beta Carotene (Natural Colouring), Magnesium Sulphate, Sodium Chloride, Sweetener (Sucralose), Potassium Chloride, Sucralose, (Sweetener), Calcium Chloride. For creatine loading, have three servings per day. For example: mid-morning, after lunch and mid-afternoon. Add one scoop to 500ml of water and shake/stir. Drink before your workout to ensure your body is sufficiently hydrated and ready for action. Sip during your session to keep hydration levels up and also deliver an explosive burst of creatine energy. This drink is also brilliant for recovery and the L-glutamine will help your body excrete lactic acid so you don’t feel stiff the next day.